So what’s Julep? It’s a few things, a monthly subscription service called Julep Maven where you get a box every month with nail polish and other beauty goodies. It’s also a great place to shop online and discover new polish colors, beauty products and tips. 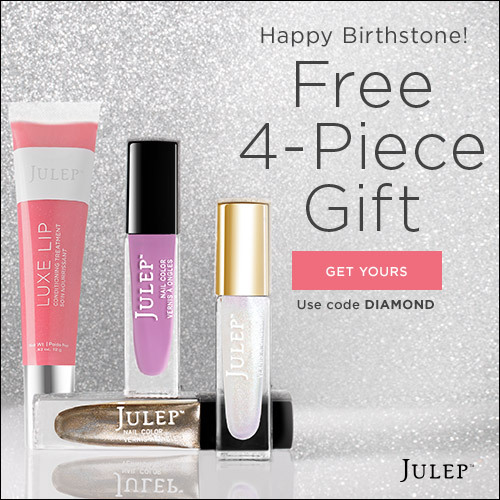 I signed up to Julep about 4 months ago and was in love immediately. I was a little hesitant at first to pay $25 a month for polish but with Julep it’s always a fun surprise to see what other bonus beauty products you get. Signing up is pretty easy; you even get your first month for free, you just pay for shipping which is like $2.99 — you can choose to cancel after that if you decide it’s just not for you. But if you live for polish you probably will convince yourself to try just another month. So here’s my collection so far; for some reason i get alot of pinks and nudes. Which I don’t mind. Your color choices are based on what monthly Maven package you choose.